Oops! I had this scheduled to post earlier, but it didn't post. I'm sorry this is so late! I'm very excited for tomorrow. The Central Florida Beauty Bloggers are having another meetup. I can't wait. I was nervous before the last one, but this time I have no nerves. I'm very much looking forward to it! Last meetup, Milani was one of our sponsors. They sent us a ton of amazing products. It's taking me a long time to review it all on my blog. This was one the great colors I received. This a new color in their core line. Deep Thoughts is a deep rich purple with a pink/violet shimmer. This is a stunning polish. I love the richness of this color with the shimmer. It really is a great purple. The formula on this was good. I had coverage in 2 coats. This is a great drugstore polish that is reasonably priced. 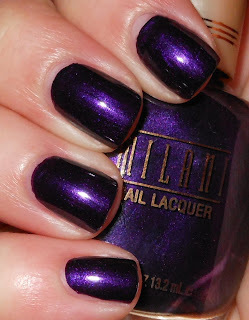 I think everyone needs a purple like this in their polish collection! Gorgeous color! Have fun at the meeting, I'd love to attend something like that! What a great purple! Have fun at your meetup! I wish there was one in Michigan! So pretty! I love purple polish! Milani is a grat fav of mine too. I picked up Orchidia on a sale and fell in love. Now I can't find it anywhere. Gona try this beauty of a dark purple. Exciting to hear about this meet-up in Central Fl. I live in West Palm Beach ~ do you have to be a beauty blogger to attend this kind of event? Cheers. Very pretty purple, love the pink shimmer in it! It's a very pretty color! I might just have to make a point to buy it...I always look at Milani's nail polish and it doesn't excite me but the swatches I see of their colors always do...I think I'm just going to have to take the leap! Most of my stash favors purples - this would be a good addition.